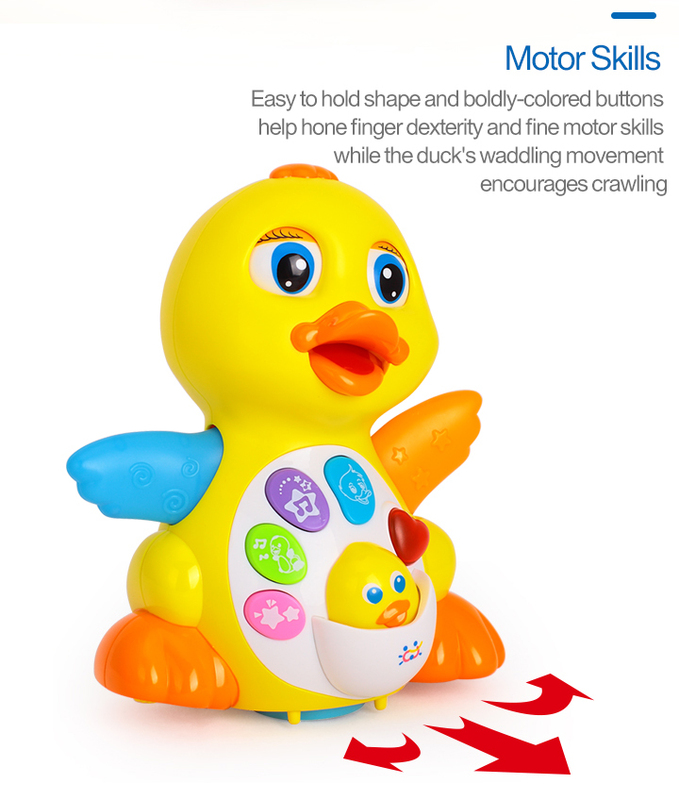 HUILE TOYS is proud to present this new amusing toy duck. 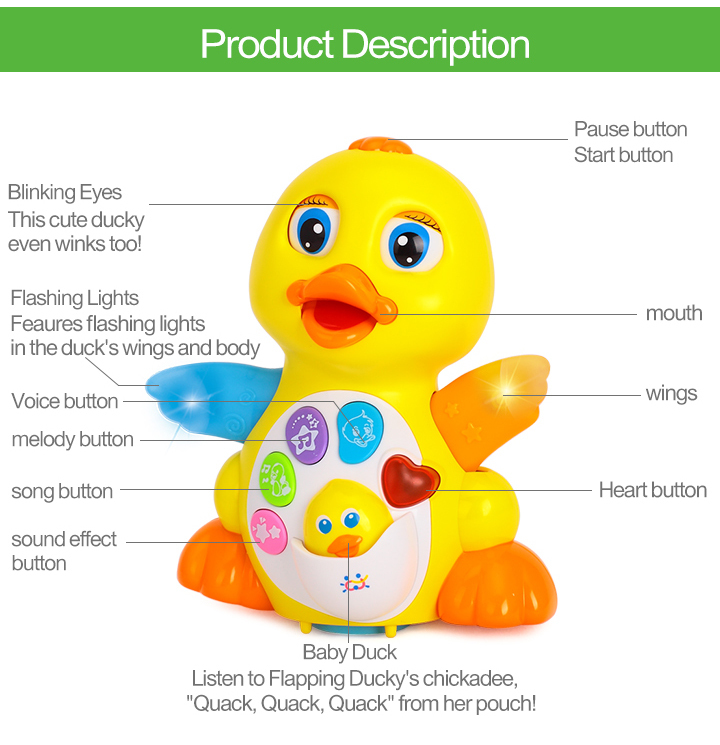 The duck has a button on top of its head that when pushed, it will trigger the bump and go motion within the toy, it will sing a fun sing-a-long tune, flap, and light up its wings. 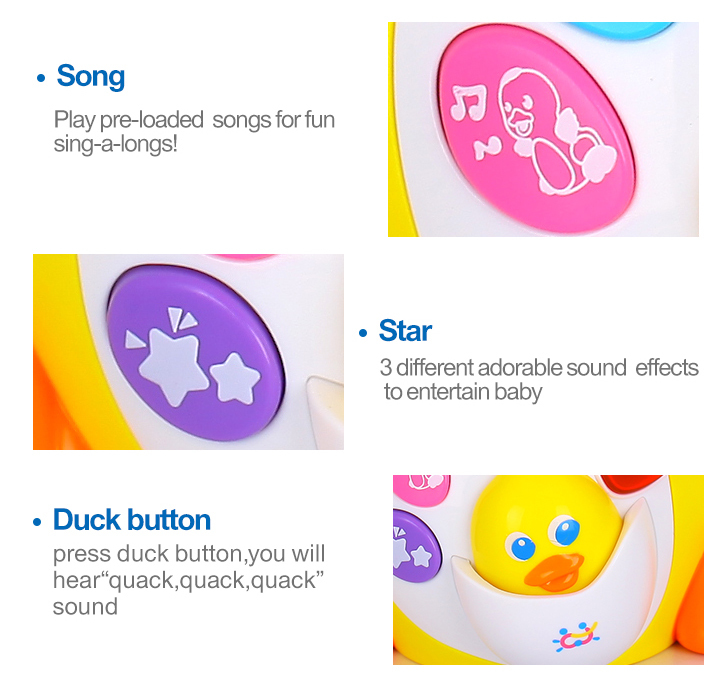 The music and bright colors are fun and appealing, but the toy also comes with five different buttons. 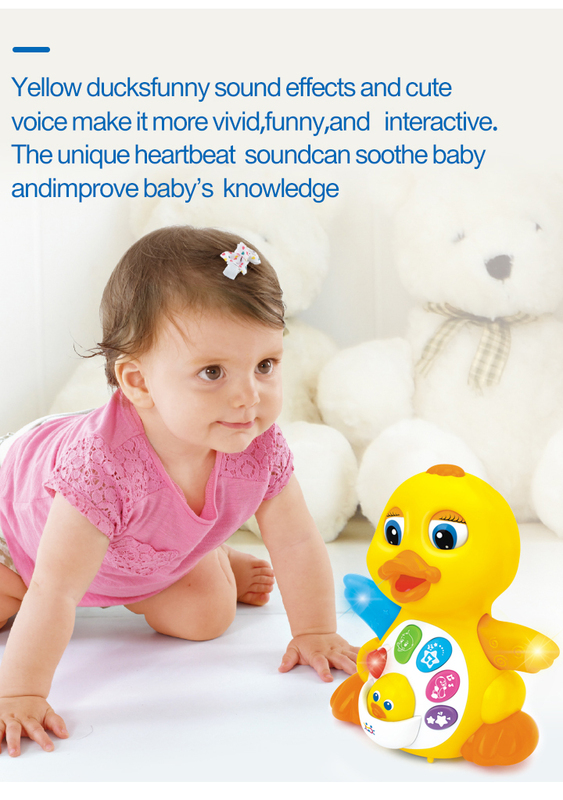 One is a sound effect that imitates a duck sound, there is a song button, a melody button, a button that allows the duck to talk, and a heart button that make a warm heart thumping sound. The duck also has a little baby duckling that, if pushed it will quack like a duckling and light up it mom's wings. All of these sounds are fun to hear and sing with, but in case a silent environment is needed, the sound can be adjusted to mute, low, or regular. We purchase our products directly from the manufacturer, so you know you're getting the best prices available. 1. Cute and Vivid Body Movement: Cute facial expression: eyes blink with music; mouth closes and opens with quack; flapping wings and vivid body movement. 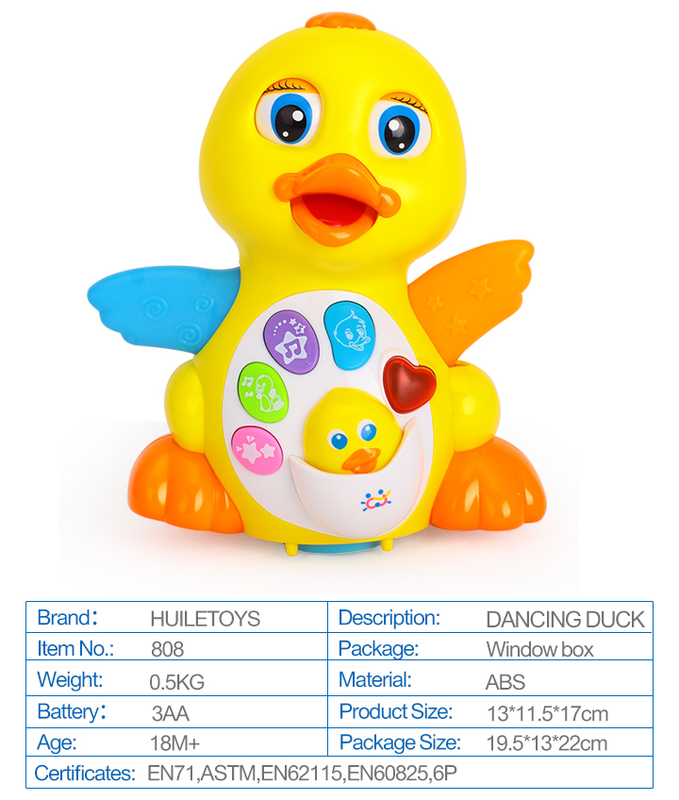 The cute yellow duck image can attract baby's affection and interest. 2. 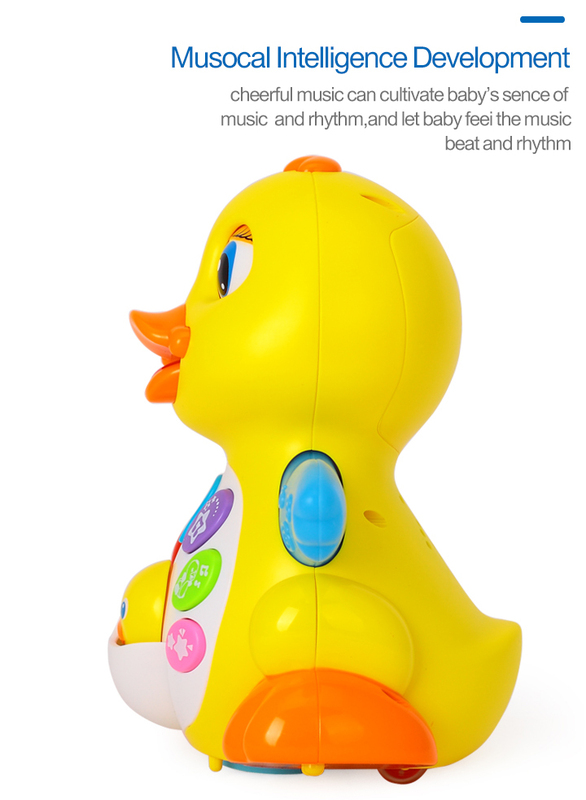 Nursery Rhyme and Melodies: The songs of "Six Little Duck" and "Quick, Quack, Quick" and 7 melodies will stimulate baby to dance with yellow duck. 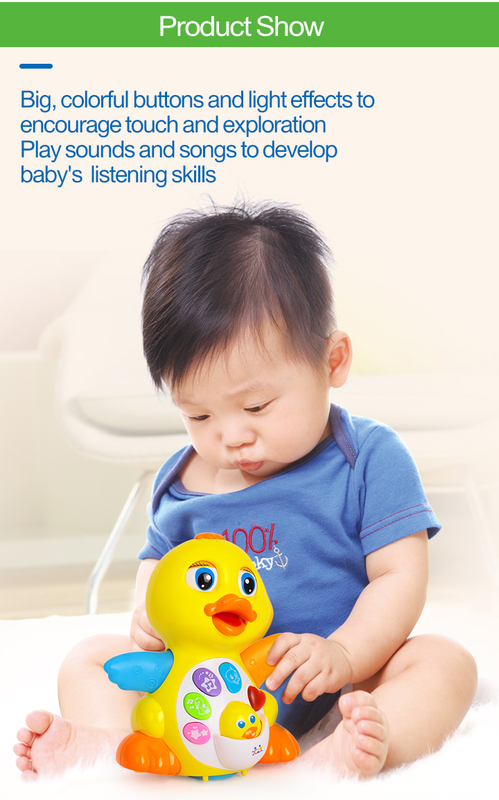 This not only can cultivate baby's sense of music and rhythm, but also can shape baby's musical talent and extraordinary temperament, and improve baby's EQ. 3. 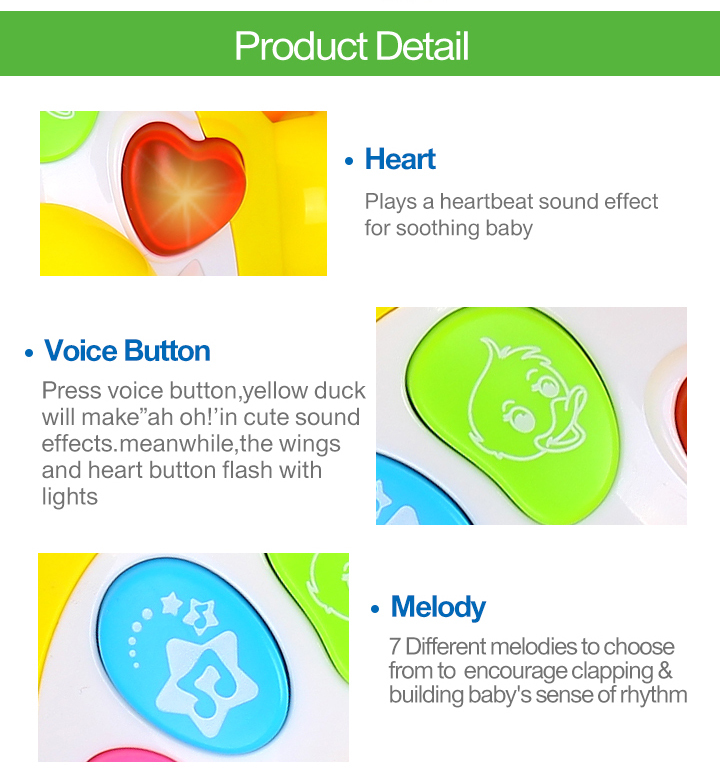 Heart Button: Press heart button, heartbeat similar to mother's can soothe baby's dysphoric mood. 4. Voice Button: Press voice button, yellow duck will make"Ah oh!" in cute sound effects. Meanwhile, the wings and heart button flash with lights. 5. Sound Effect Button: Press the star button to play 3 different sound effect. 6. Duck Button: Press duck button, you will hear "Quack, quack, quack" sound.